Posted August 18, 2015, in What's New?. It’s why you’re here. It’s the reason you’re putting in hundreds of hours of classwork, homework, and networking. 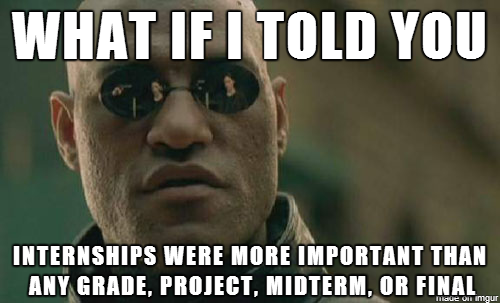 Also group projects – everyone loves those. A Job: as an undergraduate student it can seem unreal – far in the future and totally confusing. But it’s closer than you think, and in some cases can even count as credit toward your degree. August is the perfect time to focus on internships, resume building, and jobs. The beginning of the fall semester presents a variety of opportunities and support that can help position you among the majority of RSBC alumni with a job in their field waiting for them at graduation. The straightest path to success, students can take advantage of either credit or non-credit internships. Many first jobs are landed as a direct result of internship experiences, and while not currently required, they are highly recommended. To get noticed by an employer, your resume has to not only be flawless, but stand out from the pile. The Career Center has a number of seminars in September and beyond that can help you with your resume, interviewing skills, and even walk you through how to get hired on the spot at a career fair. ‹ Previous: So You’ve Been to Orientation…Now What? To submit a blog post, ask a question, or follow-up on a topic, email us! Page last updated by RSBC Academic Services at 2:40 pm August 22, 2017 . This page was printed from http://sbc-blog.camden.rutgers.edu/2015/08/18/putting-your-skills-to-work/ at 6:58 AM Tuesday, April 23, 2019.